I've just turned in my most glamorous, sparkly, vaguely inappropriately choreographed friendly appearance yet! 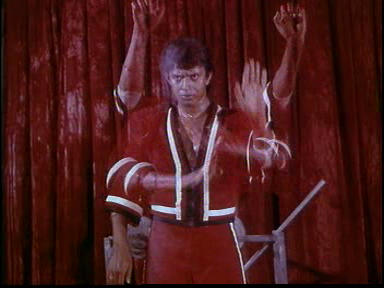 Go on, grab a front row seat over at fellow MOSS agent and old friend Die Danger Die Die Kill and revel in the under-loved Mithun Chakraborty gem Karate. Many thanks to Temple over at Cinema Chaat, who first brought this film to my attention and even sent me her VCDs. And please read her catalog of the socks of Chiranjeevi. It's a great site! I shop from them often. Keep an eye on your shipping totals - sometimes that is as much as the DVDs. Ok thanks for the all the help, I wasn't sure if it was a safe site or not. also Is there any other sites you would recommend for buying Dvds and Vcds of older Indian titles like Reporter Raju? I mostly buy online from Induna, though there are many ebay sellers who have DVDs also. And do check youtube - more and more Indian films are showing up in legal uploads from DVD and film production companies. Hey Beth, thanks a lot for sharing the short yet crisp and very interesting blog about the renowned Mithun da, hailing from the 80s and 90s of the Indian film industry. Awesome observation. Love reading your blog!